Are you ready for summer yet? I’m ready, but I’ve noticed that some of my stuff isn’t. This means I probably have some shopping in my future. To maximize my budget, I have done some research on the best times to buy various items. I worked in retail for many years and was amazed at how consistent the cycle of sales and markdowns were. No retailer wants to let another one scoop up all the business, so there is a cycle they all follow. Most large companies also follow consistent clearance schedules, and the Krazy Coupon Lady has a cheat sheet that will help you keep track of a few major retailer’s biggest clearance events and schedule for markdowns. A good rule of thumb to get the best pricing is not to buy things when you really want them. So, while June is the official start of summer, it’s not the best time to buy patio furniture, grills or summer shoes. All of these will go on sale later in the summer. Sunscreen is an exception, it will go on sale all through the season, so watch for good prices and stock up on it anytime. Home improvement items like replacement windows, roofs, and decking materials will be discounted now. Contractors will also be looking for business as well, so use your knowledge of lower supply prices to negotiate better contracts. Small tools will be on sale in anticipation of Father’s Day, so shop the first two weeks of the month. Some lawn tools might be included at this time as well. June is the unofficial start of wedding season, so cookware and tableware are going to be discounted. And while it’s also the start of hurricane season, cruises will be discounting their unfilled space, so there will be great prices for the brave. If you are booking for later in the season, trip insurance for weather issues might be a wise addition. The weather is heating up and many retailers will be marking down their summer clothing already. Since the merchandise has possibly been in the store several months at this point, it’s no longer fresh, so retailers will want to make room for new items. Large appliances such as refrigerators and dehumidifiers will go on sale this month. Patriotic items like the famous Old Navy flag tee will be heavily promoted, and most likely discounted early in the month. School and office supplies will start arriving, and pre-season sales will start. It’s a great time to start stocking up for the school year. Personal electronics are typically discounted in July. Watch for Amazon’s Prime Day and other retailers will have Christmas in July sales. This month will have a lot going on between end-of-summer clearance and back-to-school shopping. Many states will have tax-free weekends for back-to-school, here is a site that tracks the dates and explains what is included by state. Grills and patio furniture will finally be on sale, and lawnmowers as well. So, if you’ve worn out any of your outdoor things, now is the time to think about replacing them. Air conditioners should also be on sale in August. Swimwear, sandals and other summer clothing will be marked down everywhere now. In most parts of the country there is still time left to wear these, so get some current sizes as well as a few items for next year for the kids. Hold off on computers, phones, and new cars until next month. Of course, you will want to buy produce that is in season for the best prices and flavor. Summer fruits include stone fruits, berries, grapes, and melons. Summer vegetables include corn, cucumbers, peppers of all kinds, tomatoes, and various summer squashes. 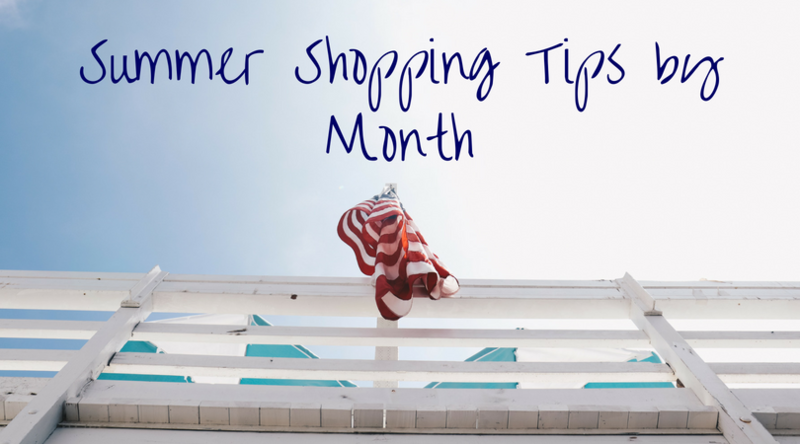 Other summer grocery bargains are things like June is Dairy Month, July is known for sales on BBQ items, and August will have lunchbox staples on sale. There is a great printable list here to help you keep track year-round. At BillCutterz, we do the same work all year to save you the most money on your bills. Take a few minutes to sign up, then go enjoy the summer knowing you’re getting the best rates possible on your monthly bills!